OneTree Alaska will host a meeting to organize its birch sap cooperative Friday, March 15, at the University of Alaska Fairbanks. Program lead Jan Dawe and OneTree staff will explain how to collect sap and how the cooperative works, and UAF climate researcher Rick Thoman will talk about how to predict green-up. The meeting will take place from 5:30 to 7 p.m. in the OneTree STEAM studio in the old Lola Tilly Commons kitchen. Buckets, taps, and a limited amount of tubing may be checked out at the meeting or from 10 a.m. to 2 p.m. Saturday, March 16. This is the third year for the cooperative. Once the birch sap starts flowing in the Interior— usually in mid-April — volunteers collect and bring it to OneTree to be processed. The sap is used in OneTree’s sap processing research and to raise money to support its operations. Sap collectors receive 20 percent of the syrup in exchange for their efforts, a sweet reward. 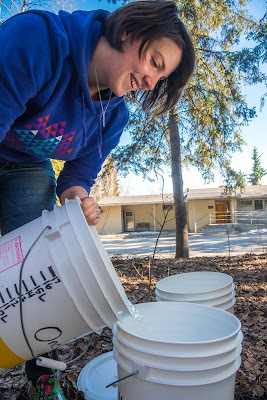 Last year, more than 50 individuals and classrooms from Salcha to Two Rivers collected 4,500 gallons of birch sap. Although the ratio varies for year to year, Dawe said it takes about 110 gallons of sap to make one gallon of syrup. This year the program will experiment with vacuum pressure methods that will allow the processing crew to reduce the heat used. The program has birch caramels and birch syrup available for sale. UAF’s birch sap work is modeled on successful maple research programs at the University of Vermont and Cornell University. OneTree Alaska is an educational and research program affiliated with the UAF School of Natural Resources and Extension and is supported in part by the Alaska Center for Energy and Power. For more information, contact Dawe at jan.dawe@alaska.edu or OneTree at 907-474-5517.